One thing I’ve not found time for at all, whilst I have been here, is to keep up with local UK news. I occasionally look at the world news, although to be honest, it was two days after the election before I found out that Barack Obama had been re-elected, when one of the locals asked me what I thought about the result. Thus it was left to Cliff to bring to my attention that my post for Saturday had an unfortunate reference to a late northern DJ and his chair. I knew nothing of his fall from grace and the accusations levelled against him, so apologies and I have since edited the blog. Secondly apologies for missing out three days’ worth of blogs. Sunday, as you know nothing much happens anyway and after two full days spent travelling to Dar and back I was really tired and ready for a rest. Monday I woke up with a fierce headache which seemed to last all day. 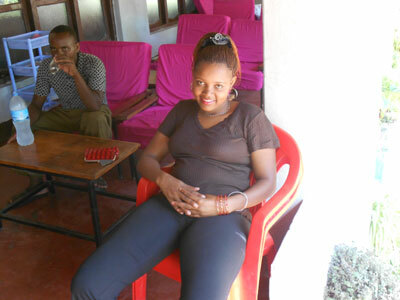 When I still had the headache on Tuesday, I started to worry a little as both for my students and for Vicky and Denis, when it has affected them, a fierce headache has proved to be the first symptom of malaria. I am not usually a man that sees a sniffle as the first sign of ‘man flue’ but I knew that the tablets I take do not claim to be totally preventative and was understandably concerned. Thankfully this morning the pain was much eased and I can only think it might have something to do with the excessive heat and humidity which I am finding quite draining. Certainly for 48 hours I 'lost my bounce'. For obvious reasons the next story is not accompanied by a picture as it involves one of my students breaking with the traditions of her religion. In the previous paragraph I comment on the heat and humidity and if anything it seems to affect the students even more than it does me. Yesterday I walked into the Form III classroom and did a ‘double take’ as I saw a brand new student sat at the back of the classroom. Even after a closer look, without actually staring, I couldn’t work out why someone should join the class with only one week to go to the end of term. It was only when the person smiled that I realised that it was in fact Asha who had gone to the extreme of removing her ‘hijabu’ and was sitting bare headed to cool herself down. I hadn’t realised how different she would look and it was quite a shock. Lessons this week have consisted of individual revision with me providing ‘msaada’ as required. The lessons have been quite productive but have illustrated even more the limitations of the educational methods. For example, to answer a simple question of working out the cost of a DVD player costing Tsh200 000 after a discount of 10%, they will first write down the formula that %age Discount = Discount/Original Price X 100. They will enter the two values they know and then rearrange the formula to solve for the actual Discount. They then write down the formula that Discount = Original Price – Price Paid, and once again put in the two known value and solve for the third. It works, but shows little understanding of what the process involves. Sorry to bore you with maths, but the maths text books which accompany this methodology, love to provide opportunities to test over and over again the student’s abilities at the four rules. An exercise on the area of a circle will start with a circle of radius 5.43 so that most of the time is not spent practising the method by doing a number of problems, but in calculating 5.43 X 5.43 X 22 / 7 at the back of their book. The National Examination in Basic Mathematics actually says at the bottom of instructions, “No Mobile Phones or Calculators allowed in the examination”. I realise that this is a very poor country and resources are limited but this day and age you could equip a class of 60 with a basic calculator for Tsh30 000 if not less. Rant over. Memories of a holiday I had with school friends when 16, came flooding back today. We went cycling in Devon and Cornwall, staying at Youth Hostels along the way and as we cycled over Dartmoor, many of the hills had ‘Engage Low Gear’ signs at the top. This was our signal to get into the middle of the road and with head down, showing all the lack of imagination that can be found in the young, vied with each other as to who could overtake most cars until the levelling out at the bottom meant that these same cars would accelerate away. You can guess what brought this to mind as I cycled down THE HILL on the way home this afternoon, as usual with both my brakes clamped on, to see Entuja, one of my Form I students, career past at great pace. It wasn’t until I saw him, further down THE HILL, raise his leg and jam his foot between the forks, on top of the front wheel, that I realised that this breakneck speed was on a bike that had no brakes. Oh the foolhardiness of youth. Disaster. Eva goes on her annual leave next Tuesday, for a month with her sister in Moshi in the Kilimanjaro National Park, so my main support will be missing for the last ten days of my stay. Thankfully the YMCA runs a college in Moshi which trains young people for various trades, including the catering and hotel industry. When we had the official opening of the hall, a young man in full Chef gear turned up to do the cooking and a couple of others waited on tables. I say thankfully because as Eva’s replacement, one of the students, called Susi is on a month’s work experience at Mkoma Bay and will be taking over Eva’s responsibilities. It’s a hard life for me out here, but I suppose somebody has to do it.